If you frequently work with people outside of your time zone or country, you know the scheduling hurdles of dealing with different time zones and holidays. 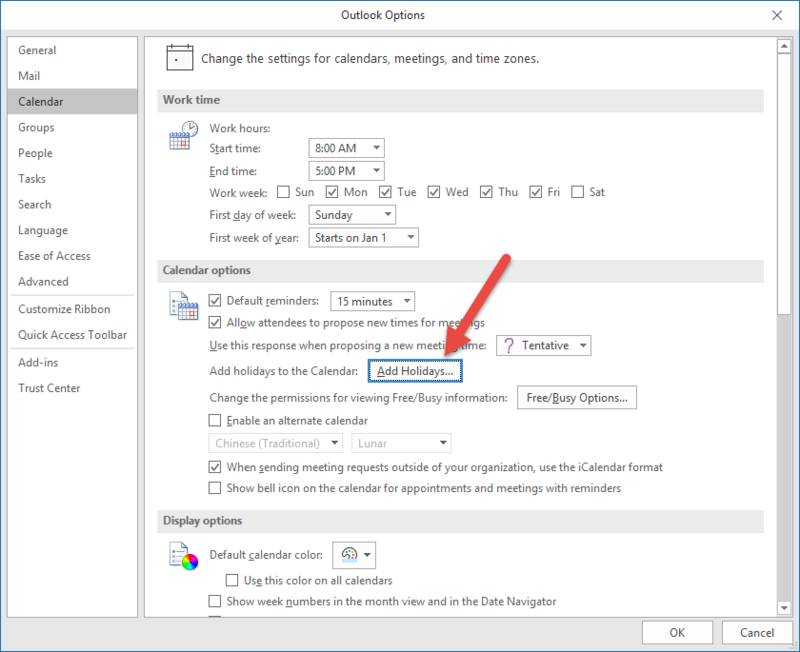 Buried in the Calendar settings in Outlook are a few ways to make this a little easier. 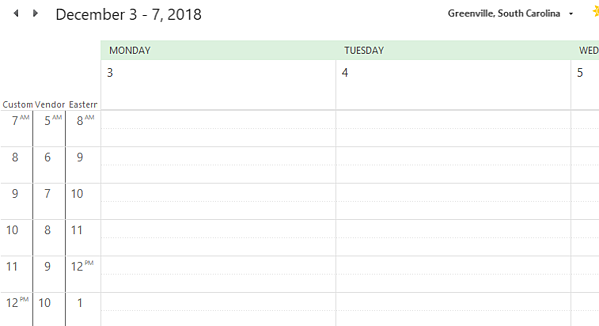 You can add multiple time zones in your calendar, so all appear at once (it’s easier to read than that sounds, trust us). To do this, on any screen in Outlook, go to File, then Options. Once the Outlook Options box comes up, click “Calendar” in the right bar. Scroll down until you see the “Time Zones” Section (this is also where you can edit your default time zone). Label the existing time zone with something you’ll recognize. Then check the box next to “Show a second time zone.” Label it with a different name and choose the correct time zone. If you want to add a third time zone, repeat this process with the “Show a third time zone” option. Your default time zone will be listed closest to the calendar listings. The second time zone will be listed next, and the third time zone will be farthest away from your calendar listings. Right now, this is only possible on the Outlook desktop app and does not carry over to the web app or mobile. Unfortunately, it doesn’t appear to be on the roadmap for development, either. 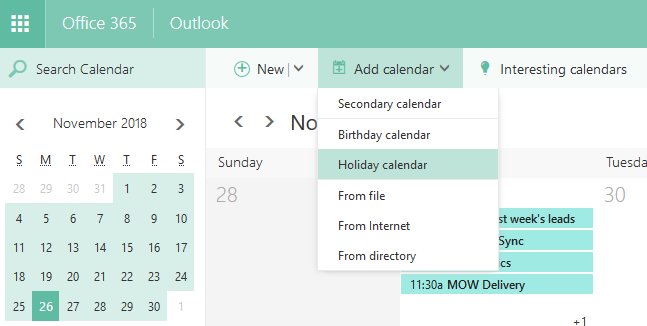 You can also add multiple holiday calendars to your Outlook Calendar. 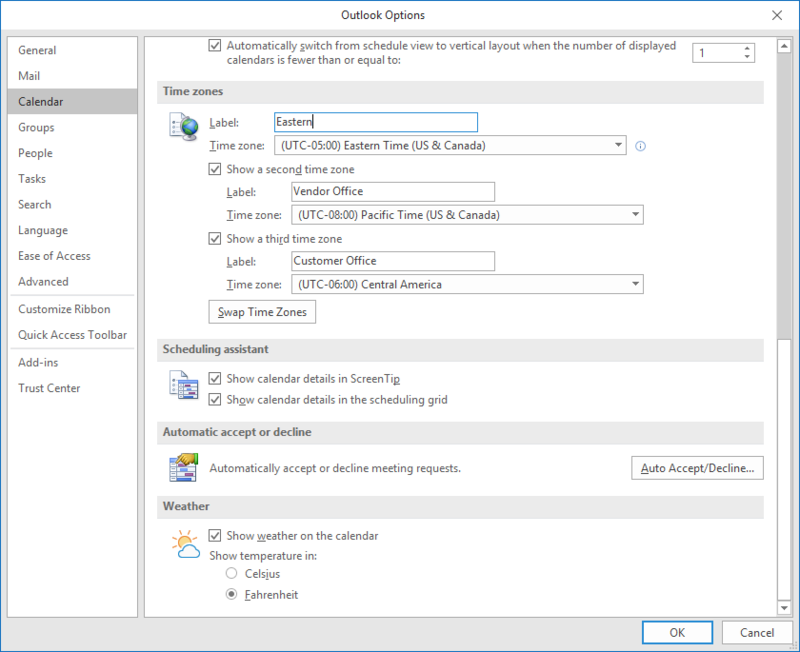 In Outlook, you can choose from holiday calendars from dozens of countries and a few religions. On any screen in Outlook, click File, then Options. Once the Outlook Options box comes up, click “Calendar” in the right bar. Under the “Calendar Options” section, there is a line for “Add holidays to the Calendar:” Click the “Add Holidays” button right next to it. You’ll get another pop up with a list of countries and religions. Select which calendar(s) you want to add and click Ok.
Go to your Calendar. Towards the top, click the “Add Calendar” drop down. You’ll get a sidebar with the list of countries and religious holidays to choose from. Choose the holiday calendar(s) you want to add and hit save. These will carry over between the desktop apps and the web app, so you should only need to add it once. Be careful not to add a calendar more than once. It will show up multiple times if you do that. It’s not quite as easy to remove them as it is to add them. You’ll need manually delete them. They’re all categorized as Holiday, so if you go to the list view and sort by category, that makes it a little easier to delete them in bulk if you need to go that route. 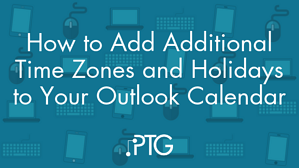 You cannot currently add holiday calendars directly from the Outlook mobile app. But they will carry over to mobile if you add the holiday calendars from the Outlook desktop or web app.